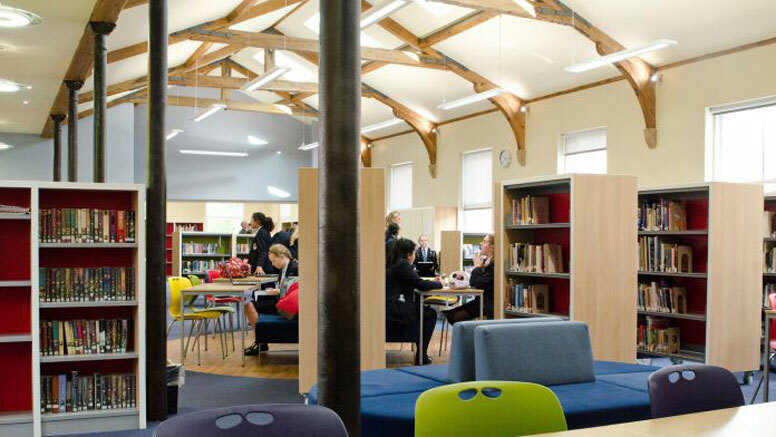 The refurbished Langham Library at Wakefield Girls High School, an independent day school, is a brand new library space that blends the old with the new. The newly refurbished ‘Langham Library’ at Wakefield Girls High School, an independent day school for girls age 11-18 yrs, is a brand new library space that cleverly brings together a blend of old and new features to create a modern learning resource space. The project was designed and managed by design consultancy Innsight Design, who commissioned Demco Interiors to bring their specialist library design knowledge and expertise to the project, including space planning, supply and installation of bespoke shelving and all furnishings. The bespoke oak perimeter shelving was designed and manufactured by Demco and their standard Cantilibra steel grey library shelving, with oak cladding, was used in the centre of the space. Both feature discreet but colour- popping red, blue and green back panels, revealed when the books are removed. End of bay display shelves are resplendent in red and study chairs in bright greens, red and yellow continue the colour jewelled theme.